Dr Sarah Parcak pointing to an archaeological location on a display derived from space satellite imaging. Seventeen 'possible' lost pyramids are among the buildings identified in a new BBC sponsored and NASA facilitated satellite imaging survey of Egypt. More than 1,000 tombs and 3,000 ancient settlements were also revealed by looking at infrared images which show up underground buildings. "We were very intensely doing this research for over a year. I could see the data as it was emerging, but for me the "Aha!" moment was when I could step back and look at everything that we'd found and I couldn't believe we could locate so many sites all over Egypt. What Parcak's team actually found was 17 structures at Saqqara, close to ancient Memphis, that had a similar size, shape and orientation to other pyramids already discovered in the area. Initial excavations indicate that at least two of the structures are most likely pyramids, but Parcak warns, "we're not going to be able to say with a 100 per cent certainty that they are pyramids until they're excavated." Even then it seems that any lost pyramids could be either of rulers or of their wives. It is thought that the burial places of some two hundred Egyptian rulers have yet to be discovered. It seems that Saqqara pyramids were based on a 52 Metre by 52 Metre footprint. The possible lost pyramids correspond to this which in Ancient Egypt would have been 100 Cubits by 100 Cubits. The Cubit being based on the distance from finger-tip to elbow. The Egyptian authorities were not initially somewhat skeptical as to the value of her findings but after being told by Dr Parcak that she had seen two potential pyramids at an area of Saqqara (Sakkara), south of Cairo, they agreed to make test excavations, and they now believe it is one of the most important archaeological sites in Egypt. Saqqara was the burial ground for the ancient capital of Memphis and was already celebrated as the site where XIIIth dynasty pyramids, dating from 3000 years ago, had been found. This image shows three square outlines with round shapes visible within. The upper two were already known of but the lower one was the subject of the successful test excavation. Also shown in purple are three sides of a less distinct possible lost pyramid. Dr Sarah Parcak told the BBC she was amazed at how much she and her team found. "We were very intensely doing this research for over a year. I could see the data as it was emerging, but for me the aha moment was when I could step back and look at everything that we'd found and I couldn't believe we could locate so many sites all over Egypt," she said. "It just shows us how easy it is to underestimate both the size and scale of past human settlements." Dr Parcak told the BBC there may be more antiquities yet to be discovered. "These are just the sites [close to] the surface," she said. "There are many thousands of additional sites that the Nile has covered over with silt. This is just the beginning of this kind of work." Dr Parcak said the new satellite technology will be a boon for archaeologists. "It's an important tool to focus where we're excavating. It gives us a much bigger perspective on archaeological sites. We have to think bigger and that's what the satellites allow us to do," she said. The Egyptian authorities plan to use the technology to help - among other things - protect the country's antiquities in the future. During the recent (2011 - Arab Spring) revolution, looters accessed some well-known archaeological sites. "We can tell from the imagery a tomb was looted from a particular period of time and we can alert Interpol to watch out for antiquities from that time that may be offered for sale." Considering that there were previously only 138 confirmed pyramids in Egypt, the possible discovery of 17 more is of major significance, and this is only a first pass covering areas that are just under the surface. Further satellite passes sensing to deeper levels of discernment may yet be technically feasible. Parcak’s research was funded by a grant from the BBC in hopes of exploring how satellite imagery can be used in conjunction with archaeology. 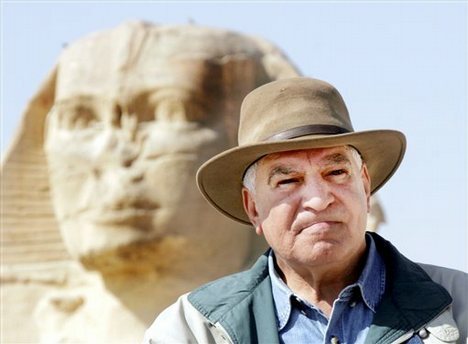 Parcak worked with Zari Hawass, Ph.D., Egypt’s Minister of State for Antiquities, who was instrumental in her being allowed access to the excavation sites. Just after the news of the discovery of 17 new pyramids broke in late May, 2011, Dr. Hawass criticised the announcement as being premature. "To announce the discovery of 17 pyramids shows how people are not careful enough … You have to wait for the conclusion to come from excavation. You have to be very careful in interpreting satellite imagery." It could be suggested that the news was presented internationally in a less qualified form than Susan Parcak, and her team, might wish.